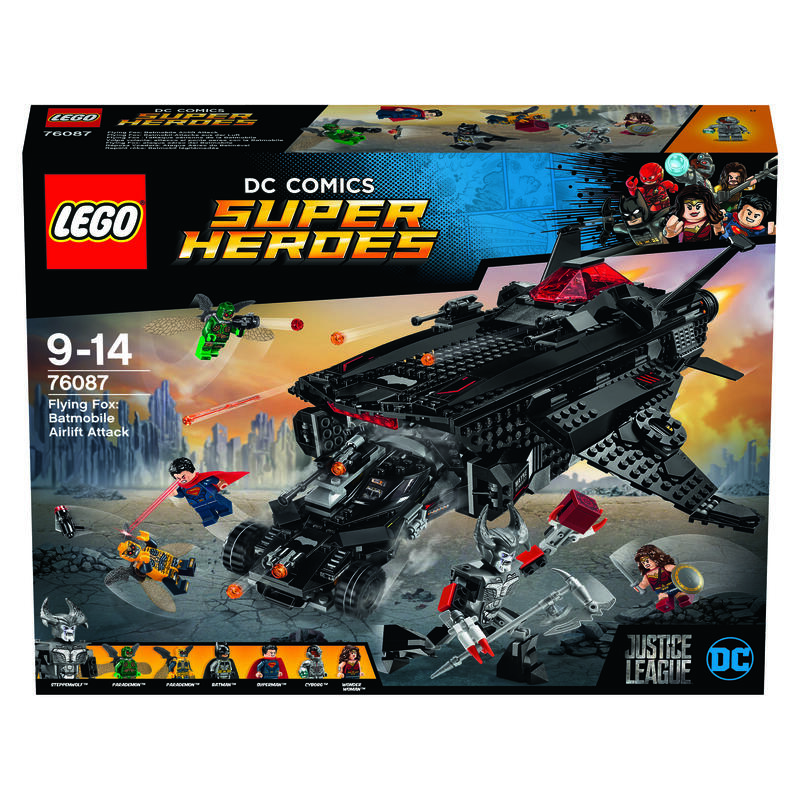 • Includes 4 minifigures: Aquaman™ (with new-for-August-2017 scale armor decoration), a Parademon™ and 2 Atlantean guards. • The Atlantis scene features a grand arch to knock over with the Parademon’s Super Jumper, 2 pillars with reed elements and seaweed elements. • Also includes the Mother Box on a base. • Weapons include Aquaman’s 2 Power Blasts and trident, the Parademon’s stud shooter and the Atlantis guards’ Atlantean PlasmaGuns. • Accessory elements include the Parademon’s Super Jumper and foil wings. • Atlantis scene measures over 5” (14cm) high, 6” (17cm) wide and 2” (7cm) deep. • Mother Box and base measures over 1” (4cm) high, 1” (3cm) wide and 1” (3cm) deep. • Includes 4 minifigures: Batman™, The Flash™ and 2 Parademons. • Knightcrawler features an opening minifigure cockpit with translucent-red windshield, dual 6-stud rapid shooters, 4 posable limbs, each with 2-wheel tracks for drive or crawl modes. • Weapons include Batman’s gun and Batarang, The Flash’s 2 Power Blasts and the Parademons’ handheld stud shooters. • Accessory elements include The Flash’s new-for-August-2017 helmet and the Parademons’ foil wings. • Knightcrawler measures over 3” (10cm) high, 8” (22cm) long and 7” (18cm) wide in drive mode, and over 3” (8cm) high, 11” (30cm) long and 7” (18cm) wide in crawl mode. Justice League is still set to hit theaters on November 17, 2017, with a big presence expected at SDCC. Which of these new LEGO sets are you most interested in?